Hearty breakfast, including a selection of breads and preserves, freshly squeezed orange juice, yoghurt, pancakes and tea/coffee provided daily. 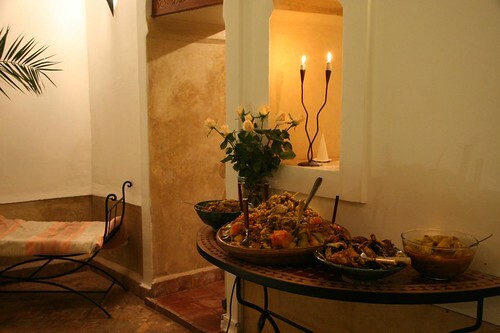 In addition, always with the idea of ​​sharing our lives in Morocco, we are able to offer you meals for lunch and dinner, served on the terrace under the stars or in one of our comfortable seating areas on each level of the Riad. See menu options and prices. Morocco is known for its gastronomy. As we have strong French roots, we are obviously particularly attached to its flavours. 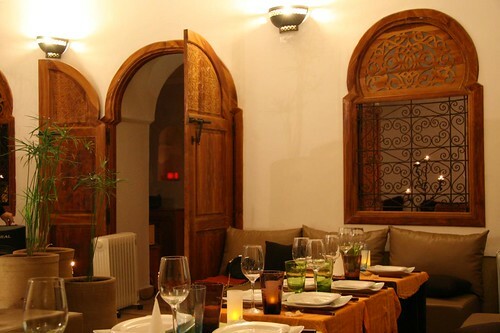 Right in the heart of exciting Marrakech, we want to take the very best of both cuisines to your table. We create our own menus and Samira mixes the flavours in traditional tagines, creating delicious dishes. To serve the freshest produce available, these menus may change with the seasons. It is around these dishes that we will explore the diversity of Moroccan Cuisine. Discover our secrets of Morocco.